The German Chancellor made similar statements in late 2010 when the type of the permanent rescue fund for the euro area (European Stability Mechanism, ESM) was designed, with Germany insisting private lenders to take some of the losses in possible debt restructuring. Then Ms Merkel was alone again, as most European leaders resisted the idea, fearing it would provoke even more intense market pressure on the troubled countries (as actually happened). 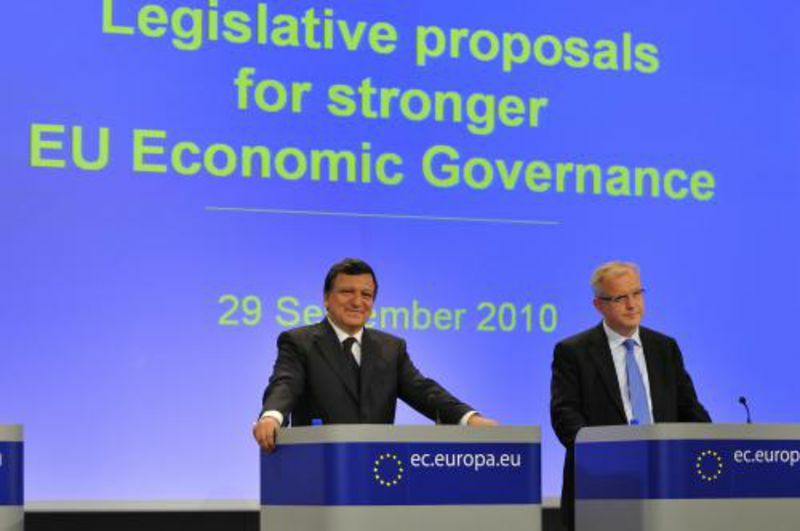 The German condition, however, has been enshrined in the rules for the ESM and was also applied to Greece, as decided by the eurozone leaders on 21 July 2011. The markets reacted negatively, fearing the Greek precedent would be repeated in Ireland and Portugal too, despite the European leaders' promises that private creditors are not threatened by new losses. Another “bad news”, according to the markets, was the Franco-German resistance to the eurobonds expressed at the latest meeting of Angela Merkel and Nicolas Sarkozy in Paris. This time, however, the financial markets are sharing the same opinion with the European institutions in the face of the Parliament and the Commission, as well as many European politicians. 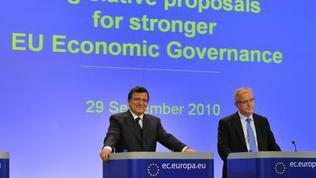 The European Commission and particularly the European Parliament has long insisted on the creation of eurobonds. In a joint statement Commission President José Manuel Barroso and European Commissioner for Economic and Monetary Affairs Olli Rehn welcomed the Franco-German decisions on strengthening the economic governance of the euro area and the appointment of a permanent president, as well as on a global financial transactions tax but did not comment on Paris's and Berlin's refusal to discuss the eurobonds as an option. Some of the main groups in the European Parliament, in turn, hastened to criticise the Franco-German approach to solving the debt crisis. First to react was the leader of the liberal group in the EP, Guy Verhofstadt, saying the euro area governance should be led by the European Commission and the eurobonds should be its main tool. 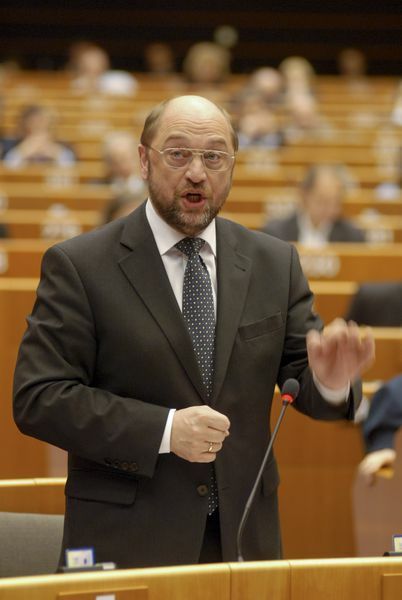 Socialist leader Martin Schulz defined the outcome of the meeting as “totally inadequate”. 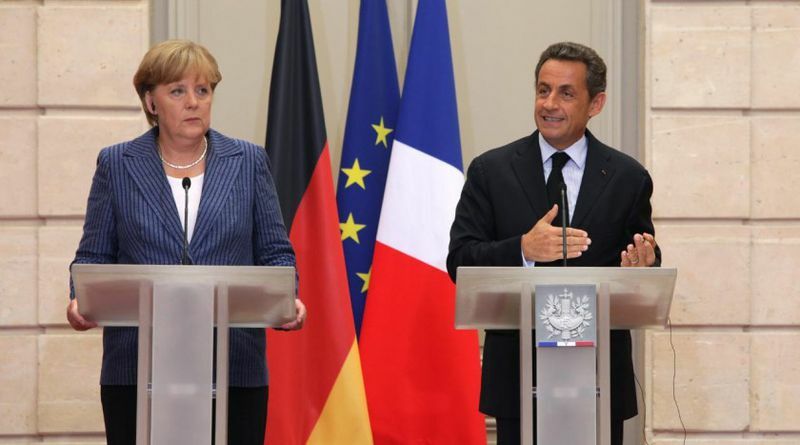 He also criticised Merkel and Sarkozy that “they have ignored solutions that offer real hope, such as the introduction of eurobonds” and haven't proposed any measures to promote growth and employment. 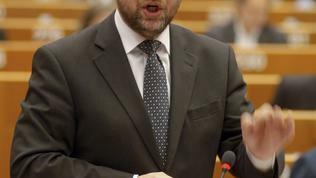 Like his colleague Guy Verhofstadt, Mr Schulz also said eurozone governance should be guided by the Commission in close cooperation with the President of the Eurogroup, Jean-Claude Juncker, and with the involvement of the European Parliament. The question what place Jean-Claude Juncker is given in the Franco-German vision of the euro area governance is very curious. 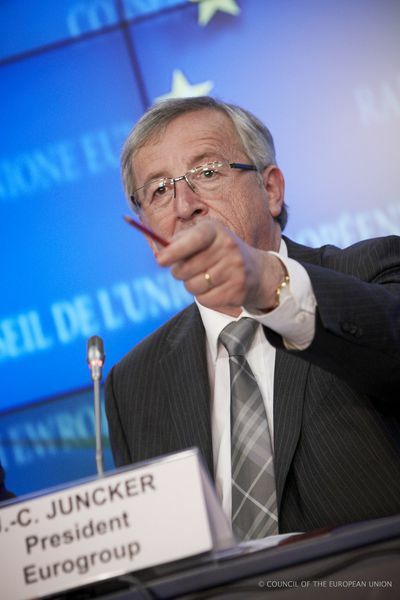 Prime Minister of Luxembourg since 1995 (between 1989 and 2009 he was also a minister of finance) and President of the Eurogroup (the finance ministers of the euro area) since the creation of the post in 2005, Mr Juncker is one of the most experienced and respected European politicians. In recent years, however, he opposed German Chancellor Angela Merkel on several occasions, as both exchanged especially sharp statements on the eurobonds. The idea of these was launched in December last year, by Jean-Claude Juncker together with Italian Finance Minister Giulio Tremonti. 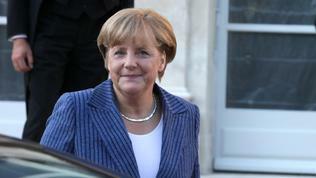 Then Angela Merkel refused even to discuss the proposal, and Juncker determined her position as non-European. From this perspective, it is now understandable why France and Germany prefer to reduce the power of Jean-Claude Juncker replacing him with the far more obedient President of the European Council Herman Van Rompuy. 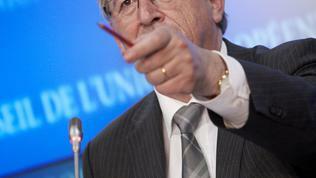 As euinside already reported, Germany's resistance to the eurobonds may soon soften. The main reason for the strong opposition of the German government to the idea of a “debt union” is German society's resistance to pay further for the rescue of troubled economies in the euro area. Chancellor Merkel is trying to win voters' trust against the background of several heavy losses sustained in the local elections this year and anticipating the parliamentary elections in 2013. Recent polls indicate that two thirds of German citizens have no confidence in Ms Merkel's ability to deal with the crisis, although it is unclear what exactly they criticise her for. Meanwhile, more voices are being heard among politicians saying Germany should not reject the idea of eurobonds a priori, but rather discuss the conditions under which the country could accept it. 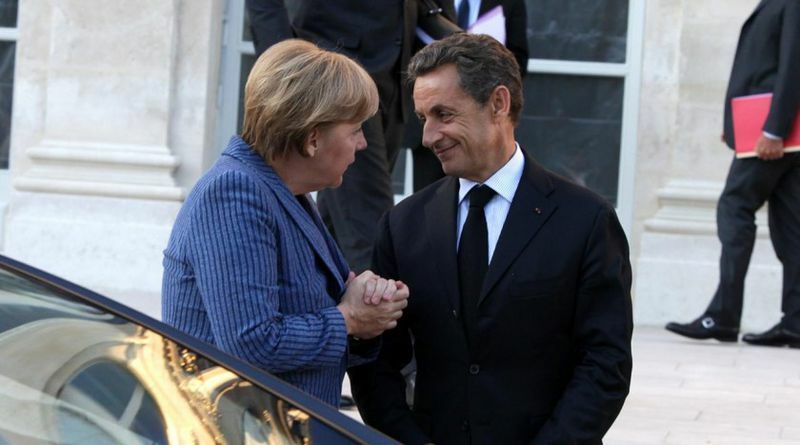 About what these conditions could be, we can judge from the letter sent by Angela Merkel and Nicolas Sarkozy after their meeting in Paris to European Council President Herman Van Rompuy. It clearly stipulates that “member states should commit to finalise the negotiation on the Commission’s proposal on “a common consolidated corporate tax base” before end-2012” and particularly the euro area member states “should be ready to consider enhanced cooperation for further progress on tax coordination”. To put it simply, this means that the price set by the creditor countries to further save the euro area is tax coordination. This has already been clearly demonstrated to Ireland when France and Germany set an increase of the corporate tax as a condition for reducing the interest rate on its bailout loan. Initially Dublin strongly resisted, and even wrote in its recovery strategy that the corporate tax of 12.5% would not be increased under any circumstances. In the decisions of the euro area of 21 July, however, we read that Dublin has agreed “to participate constructively” in discussions on tax matters. In programme [bailout countries] countries the Commission must ensure that the funds are used to support programmes' objectives and even “be involved in the selection and implementation of projects”. Funds not used should be incorporated into a separate fund for growth and competitiveness, managed by the Commission. The letter specifically notes that these proposals “should be implemented in such a way as to serve the cohesion of the European Union as a whole” and the European Parliament, the European Commission and the national parliaments should be involved in the process in their respective capacities. 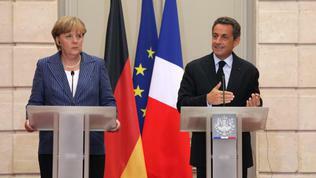 France and Germany insist the changes to take effect yet for the next multiannual financial framework 2014-2020. The debates on these ideas are yet to be held. But the fact is that it's not only about a dispute between Germany and the others, or about a fight for supremacy between different forces in the European Union. It's about the fundamental choice Europe is facing - more community with more shared responsibilities or a continuing agony of ostensible sovereignty.